Arrive at Dublin Airport. Depending on the time of arrival, Your tour begins with a day of independent touring in Dublin. Take a Hop-On, Hop-Off bus tour and enjoy a visit to one of Dublin's top attractions – Guinness Storehouse, Teeling Distillery, EPIC The Irish Emigration Museum, or the General Post Office Museum. Dine independently this evening. Overnight. Breakfast. Enjoy the morning exploring Dublin with the included vouchers. Your city tour starts at 2:00 PM from the hotel lobby with a local guide for a tour of ancient and modern Dublin. Drive through the main streets to see historic buildings such as Trinity College; rows of Georgian houses with colorfully painted doorways; and the new buildings around the Financial Centre beside the River Liffey. Take a guided tour through parts of Dublin Castle, which was the seat of power and government for many centuries and today plays a leading role in European Union activities. Return to your hotel for a welcome drink with your group. In the evening, head to the Merry Ploughboy Pub for a dinner of Irish specialties and a lively show with popular Irish songs and intricate step-dancing. Overnight. Breakfast. Depart Dublin and travel through the midlands of Ireland, which has many farms. Stop for photos of the stately ruins of the Rock of Cashel, rising high above the surrounding plain. 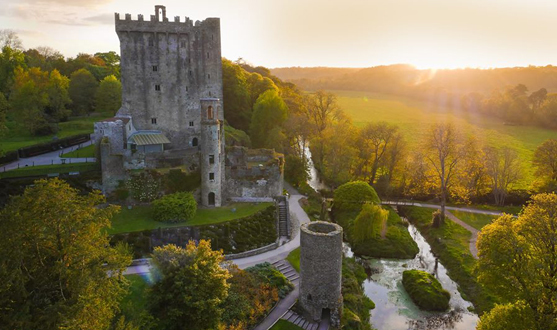 Continue your drive south and, just a few miles outside Cork, visit Blarney Castle to kiss the famous "Stone of Eloquence." Also visit the Blarney Woollen Mills where you can find quality Irish-made goods of all types, conveniently displayed under one roof. Drive through Macroom, built around a fine castle, and into County Kerry where the scenery becomes more mountainous. Arrive in Killarney, picturesquely set beside lakes with Ireland's highest mountains, the Macgillycuddy's Reeks, forming a backdrop. Check in to your hotel and relax before dinner. Overnight. Breakfast. Embark on Ireland's most popular 100-mile scenic drive – the Ring of Kerry. This winding route reveals breathtaking views of Macgillycuddy's Reeks as well as the scenic coast of beaches and cliffs. There will be plenty of stops for photos at the best vantage points. After a casual lunch in a cozy restaurant, you'll continue your scenic drive to Valentia Island where you'll visit the Skellig Experience. Learn about the island of Skellig Michael where early Christian monks lived in austere conditions and how it was used as one of the locations for the film "Star Wars VII." Pause for a stroll around Sneem, with its brightly painted houses, and at Moll's Gap for panoramic views of Ireland's highest mountains and deep valleys. Get a taste of farm life with a sheepdog demonstration of herding flocks, a shearing demonstration (seasonal), and see different breeds of sheep. Return to Killarney and enjoy a free evening for independent dining or exploring the many pubs in the town. Overnight. Breakfast. Leave Killarney and drive north to Tarbert for a 20-minute ferry ride across the wide River Shannon Estuary. 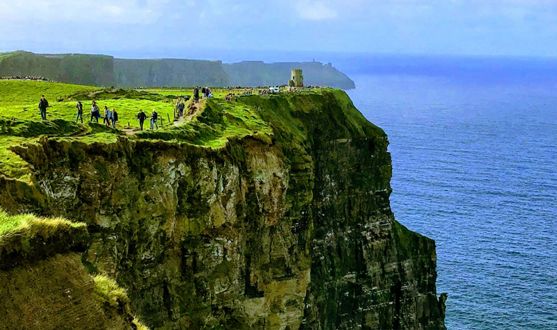 Your tour continues along the coast of County Clare to the Cliffs of Moher, a spectacular wall of sandstone that reaches almost 700 feet above the Atlantic Ocean. Drive past Lahinch Golf Course, one of Ireland's most famous, to Bunratty. Check into Bunratty Castle Hotel, which is near Bunratty Castle and Folk Park. In the evening, head out for a medieval-style feast of excellent dishes and wine. During and after the meal the lords and ladies will serenade you with songs and harp music evocative of the Middle Ages. (Please note that January departures may offer a different dining experience.) Overnight. Breakfast. Drive north to Galway city for a panoramic tour. Take some time to look around the city before traveling along the famous Galway Bay to Spiddal, where the locals still speak the Irish language. Then drive across the rugged boglands of Connemara to Moycullen to visit the Connemara Marble Factory. See how locally quarried marble is made into attractive products, and enjoy tea and scones. Travel across the country to Dublin. 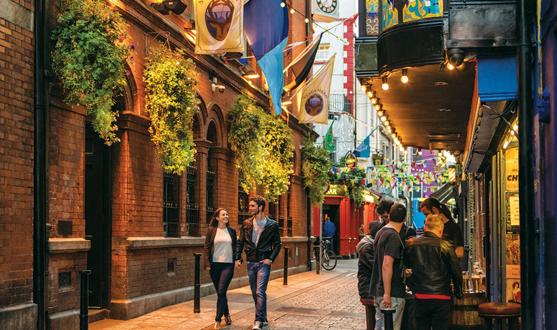 Spend the final night of your tour independently exploring the pubs in the lively Temple Bar area, or experiencing one of Dublin's fine restaurants. Overnight. Breakfast. Transfer for Dublin Airport. Accommodation 2 nights Dublin, 2 nights Killarney, 1 night Bunratty and 1 night Dublin. 1 lunch and 2 Dinners are included. 1 Dinner at Merry Ploughboy Pub for dinner and traditional show and a medieval castle banquet. Visit to Blarney Castle, Cliffs of Moher, Dublin Castle, Ring of Kerry, Sheepdog Demonstration and Skellig experience. All on-tour transportation including shuttles and ferries. Welcome get-together drink with your group. Free Wi-Fi on coaches so you can stay connected along the way. Documents wallet and backpack to keep you organized. All local taxes, hotel service charges & handling of one suitcase per person. Air Fares and airport tax. Guaranteed early check in/late check-out charges. Bookings will be subject to availability of space / rooms at the time of booking. You will be provided alternatives if units suggested are not available and advised of any supplementary costs or reductions. Prices quoted above are subject to change with or without prior notice.